Illustrated Courtroom Book Collects a Dozen Book Awards! The Illustrated Courtroom, the first full-size, full-color collection of courtroom art (it is also available in eBook format), has become one of the most-honored books published in America in recent years, winning 12 awards for academic and independent books. 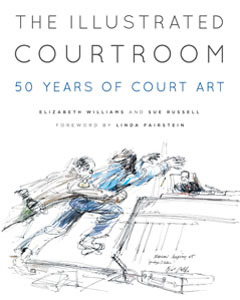 It includes more than 140 drawings from courtrooms by five of the most prominent illustrators working in the field, including Elizabeth Williams, who co-authored the book for the CUNY Journalism Press along with renowned true-crime writer Sue Russell, whose text takes readers behind the scenes of some of the biggest trials of the past half century, from the Black Panthers to Charles Manson to Michael Jackson to Bernie Madoff. CUNY Journalism Press, the academic imprint of the City University of New York's Graduate School of Journalism, has published The Illustrated Courtroom: 50 Years of Court Art. Celebrating the unique blend of art and news in courtroom illustrations, the book offers some of the best work of five award-winning illustrators covering a range of the biggest courtroom dramas of the last half-century. The book is edited by highly regarded courtroom illustrator Elizabeth Williams, who has covered many headline-grabbing trials (Martha Stewart, John Gotti, John DeLorean, Bernard Madoff) for the Associated Press, every major network and many other news organizations. Foreword is by renowned writer and former prosecutor Linda Fairstein; narrative supplied by crime journalist and author Sue Russell, whose work includes "Lethal Intent," the acclaimed biography of executed serial killer Aileen Wuornos. Courtroom artists in Britain have to work from memory, but in the USA they have the advantage of being allowed to sit with their drawing materials. The Illustrated Courtroom: Fifty years of courtroom art by Elizabeth Williams and Sue Russell (CUNY Journalism Press) is an anthology of this underrated genre. The camera has not yet displaced it in evoking tension: Charles Manson restrained by a bailiff as he leaps to attack the judge, Michael Jackson weeping as he is cleared of child abuse, Bernard Madoff led away to the lockup in handcuffs. Sign up to receive e-mail alerts with book news and get invited to book events/talks. Howard Brodie is such a legend in the news business that Walter Cronkite, who coined the label Artist-Correspondent especially for him, called him, "The ultimate journalist whose pen speaks a thousand words." Dan Rather, his longtime colleague at CBS, wrote: "At what he does, Brodie is the best of his generation and one of the best of all time." Oakland, California-born Brodie briefly attended California School of Fine Arts but was essentially self-taught. 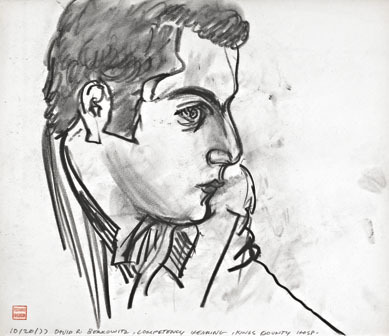 He got his start in court art in the 1960s drawing Lee Harvey Oswald assassin Jack Ruby's arraignment. He's illustrated numerous notable courtroom battles including those of Charles Manson, Klaus Barbie, the Watergate players, the Chicago Seven and Patty Hearst. 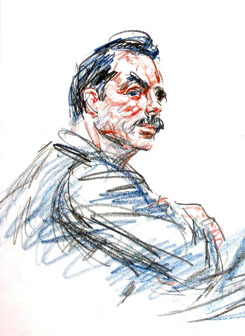 Brodie came to court art after being a sports illustrator for the San Francisco Chronicle. And prior to that, as a noted combat artist, he was awarded a Bronze Star for helping soldiers wounded in the Battle of the Bulge. He saw action in World War II, Korea, French Indochina and Vietnam. At age 80, Brodie still rode with the army, covering desert maneuvers in California for the Pentagon. His work is in the Library of Congress and the Air Force Art Collection and he has been inducted into the Society of Illustrators' Hall of Fame along with such notables as Norman Rockwell, Winslow Homer and Rockwell Kent. 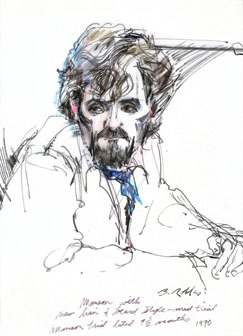 Artist Aggie Kenny won an Emmy for her work on the Mitchell-Stans trial for the CBS Evening News with Walter Cronkite. Kenny, a native of Worcester, MA, received her B.A. from New Rochelle College, and completed her post-graduate studies at NYU. Kenny covered Bernard Madoff, Subway Bomber Najibulah Zazi, the Russian Spies, John Lennon's extradition hearing and later, drew John Lennon's killer Mark David Chapman. She has illustrated courtroom scenes with mobster John Gotti, David Berkowitz (The Son of Sam), John Hinckley, James Earl Ray, Green Beret Jeffrey MacDonald, Bernard Goetz, Preppie Murderer Robert Chambers, Jean Harris, the Central Park Jogger, Angela Davis and the Black Panthers, the Attica Prison Riot defendants, Col. Henderson and the My Lai Court Marshal, Imelda Marcos, Gen. Manuel Noriega, Iran-Contra defendants Oliver North and John Poindexter, and hearings on Watergate and the Pentagon Papers. Her highly-regarded artwork of the World Trade Center responders, "Artist as Witness – the 9/11 Responders," was exhibited at The New York City Police Museum. Media clients include CBS, ABC, NBC, ESPN, PBS, CNN, Washington Post, New York Newsday, Reuters, AP, Billboard and TV Guide. She has been interviewed by and featured in the Wall Street Journal, WNBC News, WNYC and FOX Good Day New York. In 2005, Emmy-nominated artist Bill Robles made news himself while covering the Michael Jackson child molestation trial when Jackson approached Robles about his courtroom portrait of the late pop icon. Called "the best in L.A." by NBC producer Nina Zacuto, Robles got his start in court art 35 years ago. A native Los Angelino, his first job for local CBS television in 1970 was covering the 9-month long murder trial of cult leader Charles Manson and his Family members, a professional baptism by fire. 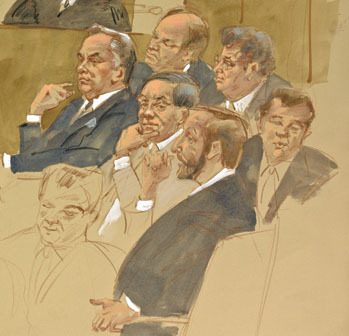 Other notable court illustrations: Roman Polanski, Patty Hearst, O.J. Simpson, Unabomber Theodore Kaczynski, Oklahoma City bombers Timothy McVeigh and Terry Nichols, actor Robert Blake, Geronimo Platt, Rodney King, Night Stalker Richard Ramirez, Lindsay Lohan and Jared Lee Loughner. Robles has a B.A. from the Art Center College of Design, a Gold Medal from the Los Angeles Art Directors' Club, awards from the New York and Los Angeles Societies of Illustrators, and three gold medals from the Broadcast Designers' Association. Robles' work is published worldwide. His major U.S. clients include CBS, LA's KCBS-TV, NBC News, CNN, CBS News, the Washington Post and the Los Angeles Times. In 2003, he received the Los Angeles Society of Illustrators Lifetime Achievement Award. The late Richard Tomlinson, who was born in Akron, Ohio, attended the Art Center College of Design in Pasadena, CA and the School of Visual Arts in New York. His work has been exhibited at The Museum of Television and Radio, The Society of Illustrators, The Art Directors Club, the American Institute of Graphic Arts, Syracuse University, and at Rutgers University Law Library where it is on loan for permanent exhibition. Tomlinson's extensive trial credits include the Black Panther 13, David ‘Son of Sam' Berkowitz, and the trials of Robert Chambers, Abscam, Jack Henry Abbott, Rev. Sun Myung Moon, Jean Harris, Bernhard Goetz, John Gotti, and the Bonanno Mafia family. He also covered the cases of Ariel Sharon v. Time Magazine, and General Westmoreland v. CBS. His client list included Metromedia Television News, Fox Television News and CNBC Business News. He was featured in Art In America, and New York Newsday, Illustrators in America and The Society of Illustrators. His entire collection of courtroom art has been acquired by the John Jay School of Criminal Justice. Elizabeth Williams' artwork has been published on the cover of the New York Times, the Wall Street Journal, USA Today, the New York Post and New York Newsday. Her work has repeatedly been exhibited in juried shows at the Society of Illustrators in N.Y. and L.A. It has also been shown at The New York City Police Museum, John Jay School of Criminal Justice, N.Y., and Conejo Valley Art Museum, CA. A native of upstate New York, she attended Washington University in St. Louis and received her B.F.A. from N.Y.'s Parsons School of Design. She did her post-graduate studies at Otis Art Institute, UCLA, Syracuse University, School of Visual Arts and NYU. Her artwork is in the collections of famous trial attorneys and major players including noted bankruptcy attorney Harvey Miller, famed trial lawyer Ted Wells and real estate executive. John Zuccotti. The John Jay School acquired her entire folio of The Sean Bell trial for their collection. 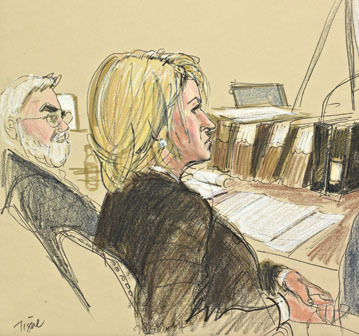 The trials Williams has covered include Martha Stewart, John DeLorean, Preppie Murderer, Robert Chambers, the Central Park Jogger, Leona Helmsley, Imelda Marcos, Bess Meyerson, Sean Bell, and Galleon hedge fund manager Raj Rajaratnam. She also drew all the court appearances of the infamous Bernard Madoff, Dominique Strauss-Kahn and Faisal Shahzad, the NYC Times Square Bomber. She covered mobsters like John Gotti and Carmine "the Snake" Persico and also Paul Castellano of the Gambino Crime Family right before he was gunned down on the streets of New York. She also covered the cases of the USFL (prime mover Donald Trump) v. the NFL, and L.A. Raiders and Al Davis v. the NFL. Other clients include NBC News (L.A. & N.Y.), CBS News N.Y., Associated Press, WCBS, WNBC, KABC, KNBC, ESPN, CNBC and Newsweek.